PLEASE NOTE: For an undefined amount of time, Annette is unable to attend to clients. Please call our main line at 314-439-5700 and press 0. One of our experienced staff members will be delighted to help you with your trip. Annette has been with Brentwood Travel since 1986. Her favorite part of being a travel consultant is working with her clients, and helping to make their dreams come true. She prides herself on her high level of service and her loyalty to her clients. Her clients are loyal to her as well, especially because she understands and accommodates their likes and dislikes while travelling (ex: no feathers in the bed, only wants to sit on the left side of the plane, etc.). Annette’s specialty is family travel, especially on trips that involve two, three, or even four generations on one vacation. She also loves planning honeymoons and does a lot of international travel. She is passionate about pleasing her clients, and loves to hear about their trips as soon as they get home. 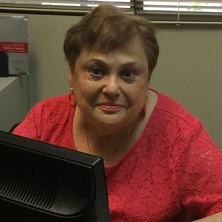 Annette’s favorite travel destinations are Paris and Rome, especially because “They are just like the postcards!” When she isn’t travelling, she loves spending time with her family and her dogs.